Just because it’s winter doesn’t mean you stop growing. 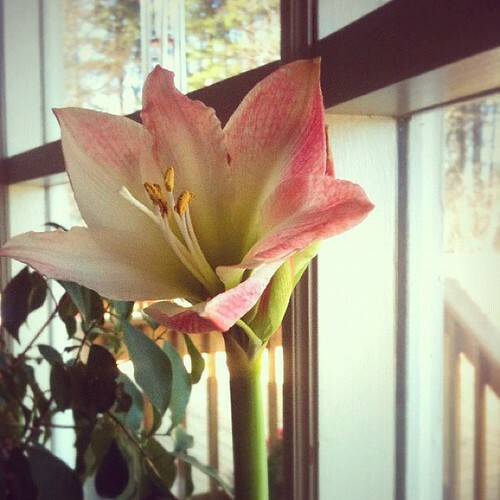 Amaryllis are easy, no nonsense plants that provide plenty of joy on the dullest of days. I keep mine on a west-facing window sill. This demure pink one bloomed within a month of planting. I have a second red one from last year that’s recently woken up from a long sleep in the basement. It’s on the south side now, but will join the others on the west window soon. I’ve also tried growing basil, but have come to realize that no matter how sunny your sunroom is in the winter, it’s not enough. I’ve managed to clip a few leaves, but the plant would really benefit from living under a grow light. What do you like to grow indoors in the winter?